Enlightenment XII — 25 or Bust! The Boardgame Players' Association is pleased to announce the 12th annual meeting of its Age of Renaissance mini-con gaming conference. Coming off its best attendance in recent years wherein it actually outdrew the tournament at WBC, Enlightenment will retain its new dual event format in its effort to draw a minimum of 25 players or host its farewell performance in 2009. Manifest Destiny will join the program as two four-round events are held in three full days of gaming. Only one of the eight rounds will conflict on Sunday moring—giving players a choice as to which event they want to play the extra round. Note that it will be possible, but more difficult, to win both events since each tournament allows players to drop one of four scores. Manifest Destiny play will begin promptly at 9 AM Friday with rounds at 2 PM later in the day and Saturday at 2:30 PM. The "pick-your-poison" choice for the fourth round comes on Sunday morning when the Age of Renaissance final round gets underway at 8 AM while Manifest Destiny players can sleep in till 9 AM. The Age of Renaissance action begins Friday night at 7 PM and continues with two more rounds on Saturday at 9 AM and 6:30 PM. The winner for the weekend will be that player with the highest total for any three of the four rounds. Only the Sunday morning slot conflicts and forces players to make a choice which of the two events they'll play for all four rounds. Enlightenment uses a unique scoring system that keeps most players in contention for a prize throughout the weekend rather than being eliminated by a poor showing or relegated to the "losers' table". Every player scores points as a percentage of the winner's score. This provides a real incentive to play against the leader to prevent run-away victories. In subsequent rounds, players are grouped according to their finish in the previous game ... with all Round 1 winners paired in Round 2, all second-place players together, and so on. The winners compete with each other - earning a bonus point for each other table's winner in that round they best by posting a wider margin of victory. Slow play is discouraged by penalizing all scores in games that take more than five hours. This scoring mechanism has resulted in nearly all Renaissance games finishing in under five hours, with some ending in less than four. LODGING: BPA has obtained a very favorable group room rate at the Holiday Inn Timonium (formerly Days Hotel) of $89 per night plus applicable state and local taxes (currently 13%). 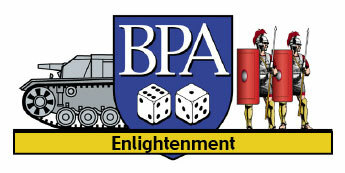 To obtain this rate you must identify your affiliation with the BPA's Enlightenment gaming conference and make your reservation before March 1, 2009 (or when our roomblock sells out, whichever occurs first) at 1-800-235-3297 or 410-560-1000 weekdays between 8 AM and 7 PM Eastern Time. After March 1, reservations will be accepted on a space or rate available basis. Alternately, you may contact the Holiday Inn Timonium, 9615 Deereco Rd, Timonium, MD 21093. Be sure to identify your affiliation with our group—both to get the best rate for yourself and to credit our group with your stay. Room options include one king or two queen size beds. Chili's restaurant is attached to the hotel and open for lunch and dinner. There is a wireless data connection in rooms and public spaces. A business center and fitness center are available. Check-in time is 3 p.m.; check-out time is 11 a.m.
Get off at the Timonium station stop. Upon exiting the station walk/turn right down Deereco Road (towards Padonia Road). The hotel is about 1/2 mile ahead on the left. Driving: From North and South Via interstate I-83: Take I-83 to Exit #17- Padonia Road. Go East on Padonia Road towards Timonium. Turn right onto Padonia Road off the Exit Ramp and stay in the Right Lane. Make a Right at the first traffic light. This is Deereco Road. The hotel is the first entrance on the right. There is a large parking lot in back of the hotel, if the front lot is full. Additional parking is available at next two buildings past the hotel, if the hotel lot is full. From North and South Via interstate I-95: Take I-95 to I-695 North towards Towson. Take Exit #24 to I-83 North. Go North on I-83 approximately 2 miles to Exit 17- Padonia Road. Follow Directions from I-83 above. From the West Via Interstate I-70: Take I-70 East towards Baltimore. Take Exit #89 to I-695 North towards Towson. Take Exit #24 to I-83 North. Follow Directions from I-83 above. COST: Pre-Registration is $40 (or $30 for BPA 2009 members) if received by March 14. Send your check payable to BPA, to 7766 Valley View Court, Hickory, NC 28602. On-site registration will be $40 regardless of BPA affiliation. Print the Registration Form found here. REFUNDS: The Enlightenment pre-registration fee is a discounted rate extended in exchange for a guarantee to attend. As such, no refunds are allowed. Last updated 2/19/09 by kae.